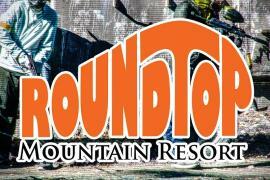 Roundtop Mountain Resort offers unique year-round fun in a picturesque mountain setting. Summer at Roundtop offers an adventure park featuring OGO balls (only found 3 places in the United States) a 600' Super Slide combined with a chairlift ride to the top of the mountain, and tons of interconnected climbing features. For the more adventuresome individuals, try the Vertical Trek zipline canopy tour beginning with a chairlift ride to the top of the mountain and descending the side of the mountain over a series of 10 ziplines interspersed with with cargo nets, cargo nets and wire crossings through the treetops. Winter activities include skiing, snowboarding and tubing. 100% snow making means that as soon as the temps drop consistently below freezing, we'll have a mountain of snow! Year-round activities include 10 different themed paintball fields, facilitated team-building at the ropes course and catered events. Roundtop specializes in group fun including: corporate events, student travel, Boy Scout and Girl Scout troops and birthday parties. Description: Meeting Rooms: Our beautiful mountain lodges can accommodate up to 400 people for an indoor event. We offer wireless internet access, sound systems and projectors - everything you need for a successful meeting. We offer two different meeting room locations. Catering is provided by the Altland House, one of York County's premier caterers. From a simple picnic to a gourmet banquet, we offer menus for all tastes and budgets.